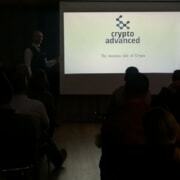 We are proud to launch CryptoAdvanced our Premium Crypto Newsletter, Blockchain Consulting and Blockchain Conference service. Special thanks to Athanasios T. Ladopoulos and John Aslanis for being the key supporters and leaders of this new and innovative business unit. A business and financial approach to the blockchain covering the tech and business applications. What is the real value of this technology and which cryptocurrencies can really make the difference? What are the trends that are going to shape the cryptocurrencies of the future? Join us and be among the first to get access to the deep-tech analysis of Athanasios Ladopoulos and the retail side of crypto by John Aslanis. Ok its time you stop thinking cryptocurrencies as stocks and start considering how you can use the blockchain in your business and start reducing your costs and maximizing your profits. We are the people you should work with on this. We will guide you on how the blockchain can make the difference for you and design the best token model for your operations. From token issuing to fin-tech apps we cover the whole range. The best way to connect the traditional market with the cryptoeconomy is to bring these two worlds together. Athanasios and John decided to join forces and make a difference. Stay tuned and participate in our Crypto Advanced Conferences in order to meet in person the pioneers from both sides and discuss live the best way to disrupt the market and position your company above your competitors.